Greg Sizemore is the Director of the International Trade Administration’s U.S. Commercial Service in North Carolina. The Discover Forum featured an impressive list of speakers providing insight on doing business around the world. I just met 400 new contributors to the nation’s economic recovery. After wrapping up this year’s Discover Forum, a premier event for businesses looking to increase exports, I’ve never been more confident about American companies and their desire and ability to compete in the global marketplace. Our ITA team worked with more than 300 business attendees from Raleigh, N.C., to San Antonio, Texas, to St. Paul, Minn., focusing on export strategies. We had presentations about doing business all around the world, featuring speakers from the public and private sector who know how to compete and win overseas. Commercial diplomats from embassies across the world shared insights about doing business in their respective markets. Representatives from companies like Western Union, Research Triangle Institute International, and Accenture shared their lessons learned and the strategies that have led to export successes for their businesses. 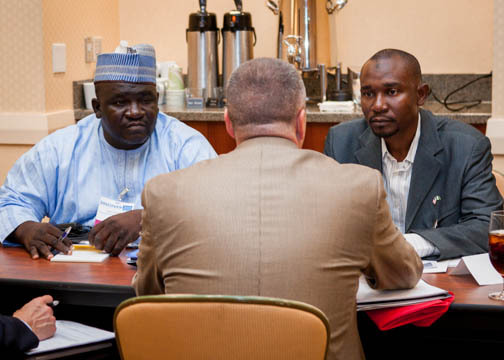 A buying delegation from Nigeria attended the Discover Forum, making connections with American businesses looking to do business in Africa. On top of that, U.S. commercial diplomats from 20 countries conducted more than 700 one-on-one counseling sessions with individual companies looking to develop export strategies for markets like Kuwait, Australia, and Chile. A special buying delegation from Nigeria met with several companies about doing business in Africa. Add that in with the networking that always occurs at events like this, and what you have is a top-notch forum to assist any U.S. company interested in doing business overseas. Discover Forum provided the knowledge and the connections that can give any business an advantage in the global marketplace. Even better, the learning opportunities don’t end now that the forum is complete. Our trade specialists will continue to work with clients who attended so we can further develop export strategies. We’ll continue to share the information from this forum with other clients who request assistance from ITA. Upcoming annual events like Trade Winds, ACCESS, and next year’s Discover Forum will provide further learning opportunities for U.S. businesses. You can learn about all of our export promotion events and services at www.export.gov. I can’t stress enough how helpful an event like this can be for a globally focused American business. I’m certain that anyone that attended Discover can vouch for how much they learned. Wherever your business is, our ITA team is standing by to help any company that is ready to start exporting. I encourage you to contact your nearest Export Assistance Center, and I hope I will see you next year at Discover.